For women, we are in an era where it is imperative that we fight to maintain our rights, self-respect, and dignity. This is a witty, true story defying the myth, “women are troublemakers, elevator screamers, and falsely accuses men.” It is a story that takes you behind the Federal Government’s closed doors, revealing what it’s like for women opposing sexual harassment and turns to a system created to fail them.” After flipping through the pages of Ms. Dawson’s book, I had to put down the Michelle Obama book…, Mrs. McKie. Author’s note: Forgiveness is key! Natresha is a public servant and motivational direct speaker from Washington, D.C. She believes Nouthetic Counseling (counseling from the Word of God) to be one of the most revolutionary means of Counseling today. Among her many community and social activities, including her nonprofit organization, Serving Our Communities One Woman at a Time, she consults with others, helping them put their stories in writing, sorting through employment matters, including tackling the hard questions. 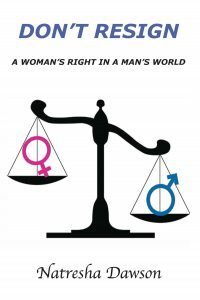 Don’t Resign: A Woman’s Right in a Man’s World is Natresha’s first published book.